Aodhán Coyne singer, Clare; Sibéal Davitt sean-nós dancer, Dublin; Tulla Set Dancers All Ireland winners. Comhaltas Ceoltóirí Éireann plays a vital part in the worldwide advancement and promotion of Irish music and culture in the 21st Century. However, we should never lose sight of the great musicians and composers who kept the music and song alive in more difficult times. Tunes and songs that are centuries old are still being performed today thanks to the efforts of composers and collectors, musicians and singers, who fought a growing tide that threatened to sweep our culture aside. From Carolan and Raftery to Ó Riada and Rowsome, visionary men and women have made possible a unique inheritance for our generation – a true ‘Legacy’ for the Ireland of today. 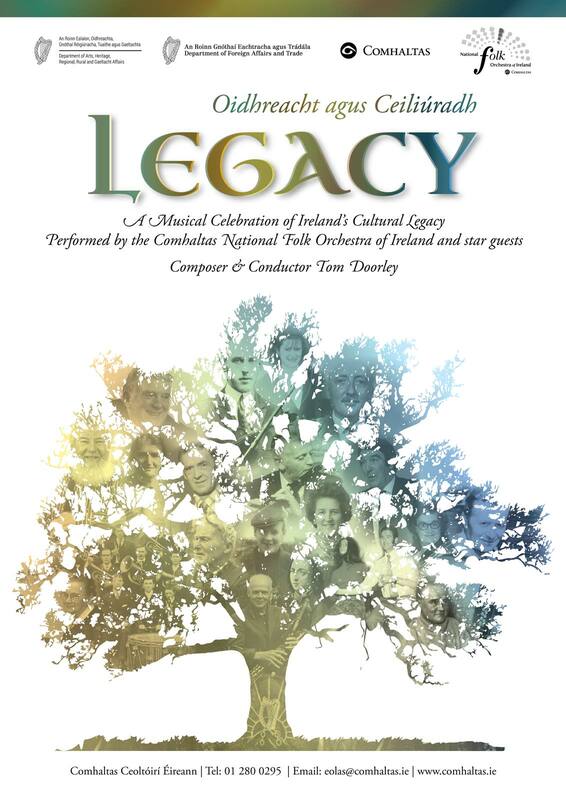 ‘Legacy’, featuring The Comhaltas National Folk Orchestra of Ireland and special guests, will take you on a journey through the musical and cultural landscape of Ireland honouring some of the great men and women who have helped shape and define our tradition down through the generations. Inspired by some of the our greatest tunes and songs, Legacy will also feature newly composed music by Tom Doorley and will be scripted and directed by Ray Conway. Tom Doorley is an original member of Danú and is a highly acclaimed musician, composer, arranger and musical director. As a founding member of the Comhaltas National Folk Orchestra, Tom composed and arranged Slad agus Slanú which was performed to great acclaim in the National Concert Hall and was broadcast on RTÉ television. Ray Conway has written and directed for film stage and radio, and directed ‘Macalla 1916’ for the Comhaltas National Folk Orchestra which premiered at the Barbican Centre in London before embarking on a widely acclaimed tour of Ireland. As part of Fleadh Cheoil na hÉireann 2016, he adapted and directed ‘Seachtar Fear, Seacht Lá’ a 1916 pageant performed at Cusack Park, and wrote and directed ‘1916- A Terrible Beauty’, performed at Glór. The Comhaltas National Folk Orchestra of Ireland is made up of over sixty of the finest young traditional and classical musicians from 20 different counties in Ireland and from the U.K. The orchestra was first formed by Comhaltas Ceoltóirí Éireann in the late 1980s and has always attracted the most gifted young Irish musicians and singers. In 2013, the Orchestra was reformed to perform the Boróimhe Suite by Monaghan composer Michael Rooney. The Boróimhe Suite was written to commemorate the millennium of the death of Brian Ború and was performed in Armagh, Cashel, Killaloe and Dublin to full houses over the Easter period. It was also performed at Fleadh Cheoil na hÉireann in Sligo and was recorded by RTE Radio and transmitted at Christmas 2014. 2016 and the centenary of the 1916 Rising was a momentous year for Ireland and the Comhaltas National Folk Orchestra played a significant part in it. Playing for the relatives and families of the 1916 survivors in the RDS on Easter Saturday night was a proud moment for all involved and the newly composed suite of music by Michael Rooney, which Comhaltas commissioned specially for that historic occasion, was a memorable salute to the men and women who won for us our independence. This event comes under the Music Generation Clare Leath/Leath Go See! 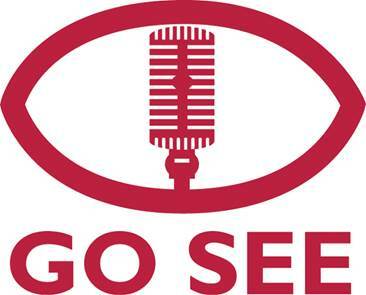 Scheme which supports the young person and the music sector by encouraging attendance at music events. Music Generation Clare is working with venues and festivals throughout the County, to provide tickets discounted by 50% to enable young people under the age of 18 to attend live music performances, (bookings must be accompanied by one adult).